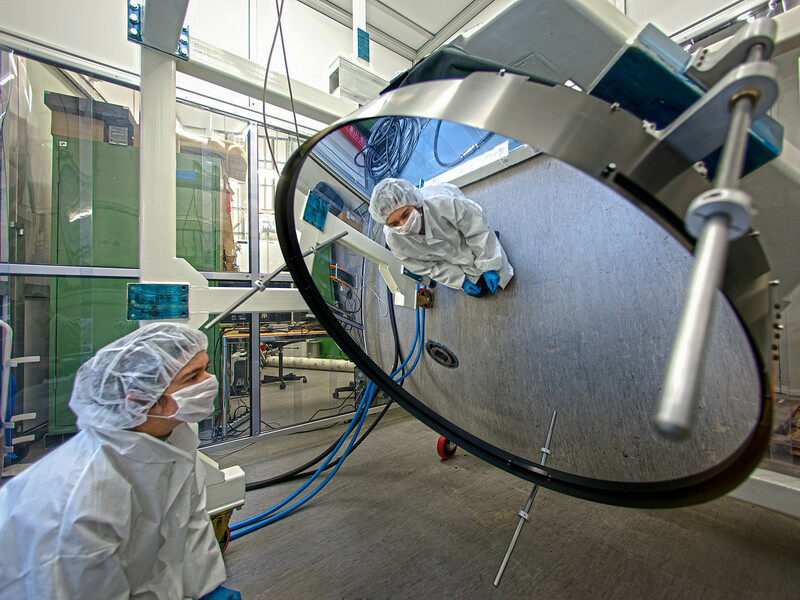 This remarkable deformable thin-shell mirror has been delivered to ESO at Garching, Germany and is shown undergoing tests. It is 1120 millimetres across but just 2 millimetres thick, making it much thinner than most glass windows. 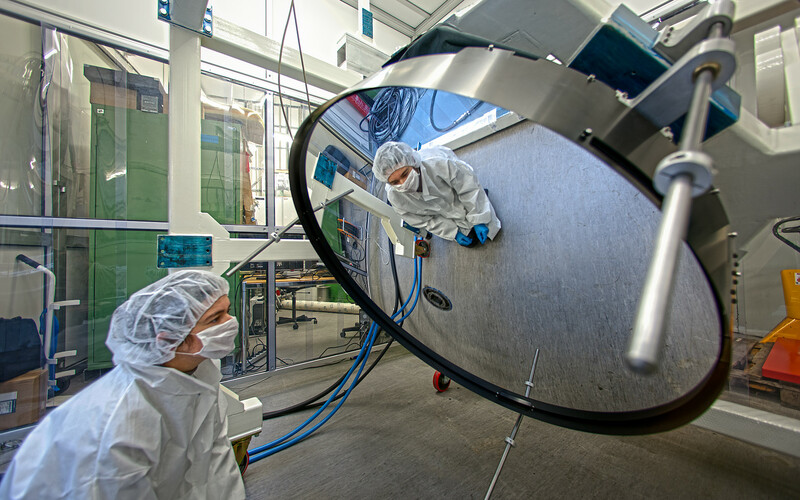 The mirror is very thin so that it is flexible enough for magnetic forces applied to it to alter the shape of its reflective surface. When in use, the mirror's surface will be constantly changed by tiny amounts to correct for the blurring effects of the Earth’s atmosphere and so create much sharper images. 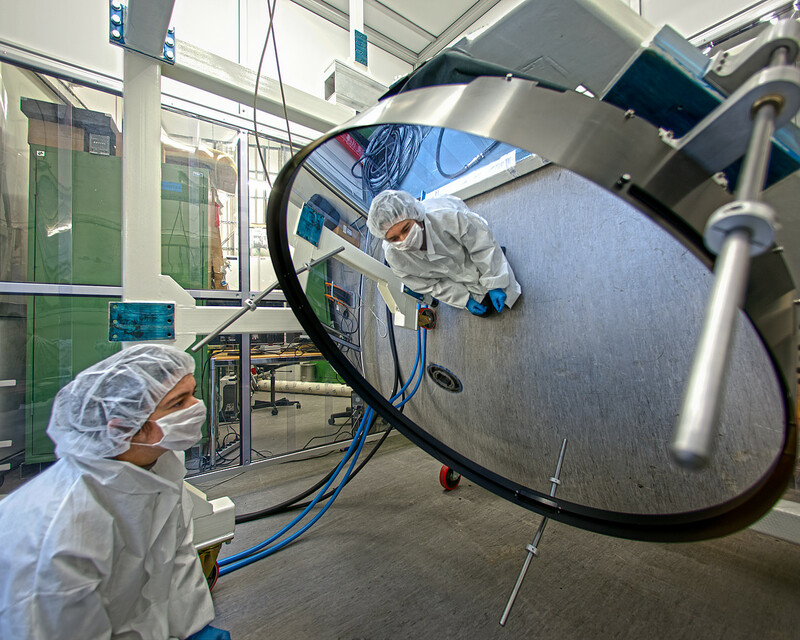 The new deformable secondary mirror (DSM) will replace the current secondary in one of the VLT’s four Unit Telescopes. The entire secondary structure includes a set of 1170 actuators that apply a force on 1170 magnets glued to the back face of the thin shell. Sophisticated special-purpose electronics control the behaviour of the thin shell mirror. The reflecting surface can be deformed up to a thousand times per second by the action of the actuators. The complete DSM system was delivered to ESO by the Italian companies Microgate and ADS in December 2012 and concludes eight years of sustained development efforts and manufacturing. 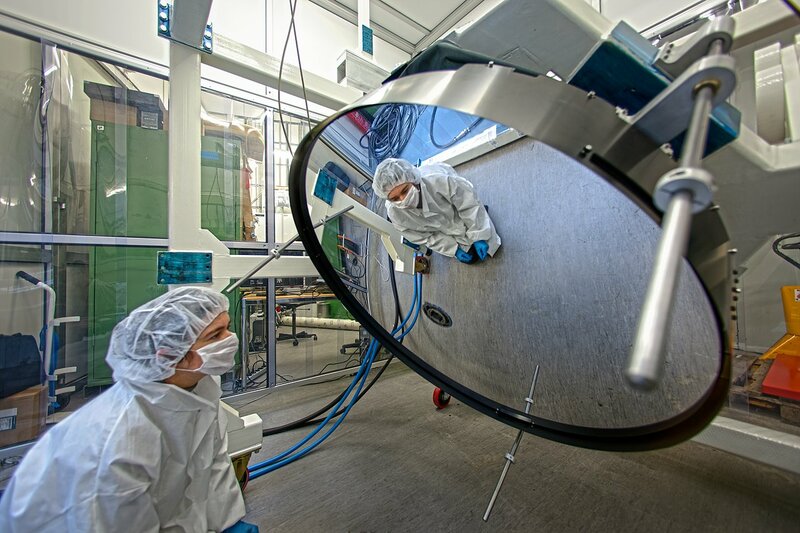 This is the largest deformable mirror ever produced for astronomical purposes and is the latest of a long line of such mirrors. The extensive experience of these contractors shows in the high performance of the system and its reliability. The installation on the VLT is scheduled to start in 2015. The shell mirror (ann12015) itself was manufactured by the French company REOSC. It is a sheet of ceramic material that has been polished to a very accurate shape. The manufacturing process starts with a block of Zerodur ceramic, provided by Schott Glass (Germany) that is more than 70 millimetres thick. Most of this material is ground away to create the final thin shell that must be carefully supported at all times as it is extremely fragile.